Great fishing off Ramsgate today with Skate, Smoothound, Channel Whiting and of course the old favourite Doggies. The Skate came to herring while the Hounds preferred squid over our peeler crab bait. With this years may water having appeared colouring the water squid is often the favourite bait for the Hounds. A few Bass starting to show and as the water clears over the next few weeks Mackerel should arrive. Still plenty of dates available for individuals or groups. Give me a call and let's go fishing. The fishing is improving with good size Thornback Ray being landed aboard Duke lV on most trips, many of these fish are large females weighing up to 14lb. The Smoothies are arriving now along with the peeler crab so opportunity for these are getting better by the day. Bass numbers are increasing with the large fish amongst the first to arrive so you could be lucky and pick up a big double if your lucks in. Plenty of dates still available including weekends for whole boat or individuals. We have quality tackle and the best bait available so contact me and let's go fishing. See above pics of Skate we've recently landed on Duke IV. Firstly we would like to wish all our clients a very happy Xmas and a prosperous New year. Plenty of Whiting around at the moment along with good numbers of Skate. Everything is feeding on the herring and sprats so it's fish and squid bait that is catching. There are a few Cod around this year as they are coming to the nets although catching on bait is not so easy but always in with a chance if you're out there so come along and shake off the winter blues. Call me to come fishing today. Pic shows Padas group with part of todays catch. Winter has arrived with a bang with cold NE winds cooling the water bringing the Whiting in in numbers, most are small for now but l ate the ones that were left yesterday and very tasty they were. The small ones make good fodder for Bass and Cod, a few of which are starting to show. It's been a few years since we last caught Cod in numbers but we live in hope that more will show up this year. Skate numbers are increasing now, we landed 8 last weekend so well worth the effort. Still weekend dates available for whole boat or individuals available so wrap up warm and let's go fishing. With the water still warm we are enjoying some great fishing off Ramsgate with Smoothounds and Bass in good numbers. When it clears Mackerel are also a possibility. Yesterday we caught Hounds to over 10lb along with Bass to 4lb. We also caught a small Bull Huss a member of the shark family, similar to a doggy. Shepherd landed the best fish a Starry Smoothound of 10lb 8oz. With Whiting numbers increasing autumn is close so along with Skate we will be looking for Cod. Although they have been few around some have been caught along the coast so maybe this winter will give us a few. Still weekend dates available for whole boat or individuals throughout Oct and November so give me a call to book. After the heatwave the weather has settled into a breezey, showery period. Along with Skate, Bass and mackerel we are getting a few Whiting. August is the month we expect large bass although with mackerel numbers down they are proving difficult to find. We should get a run of autumn skate soon along with a run of smoothounds as they head south. A few Cod are showing up already so we are hoping we may see a few this coming winter. Still weekend dates available for whole boat or individual booking so call me up and lets go fishing. The summer species have arrived with Mackerel and Bass numbers increasing daily. We are still catching plenty of Skate along with Smoothounds on rough ground. As the dirty water caused by a particularly bad case of may rot, dissipates the Mackerel are showing up to the south of our area. With fresh mackerel for bait the Skate and Bass catch rate increases. So prospects look good for fishing and with dates available for whole boat or individuals available give me a call and book a day fishing. As the weather warms the fish are arriving with Skate ,Smoothounds and Bass coming into our area. Skate fishing has been very good with up to 16 fish to double figures being landed aboard Duke IV in a single tide. The bait of choice is herring despite most have now moved off into deep water to spawn.....Smoothounds are looking for the crabs that are now shedding there shells, a process that they do annually to grow. This leaves them vulnerable until the new shell hardens. Collecting crab during this time gives us a super bait for the hounds. These fish move around in packs so some days we land a number of fish with some up to 10lb and above in weight. Smoothounds are very powerful fish that although they look similar to the humble doggie that is where the similarity ends with hounds testing the gear to the max...... Bass are starting to show up with some big fish being caught in the nets along with some quality Cod so dust off the fishing rods, call me and lets get out there and see what we can catch.....Pic shows a nice Smoothound caught and released by Paul fishing frozen crab as bait. Duke IV has just been returned to the water following the annual maintenance. March seemed a good time as hopefully the weather should be improving....how wrong can you be? Anyway today we got out with Jake & Darren onboard and headed north stopping on an old Cod mark. Unfortunately apart from a Skate and a few Whiting, no Cod. We then moved onto a bank for the Skate......We were not disappointed as the Skate fed well and we ended the day landing a further 17 up to 10lb, keeping some for the pot many were returned. As the water warms we can expect plenty of Skate along with Smoothounds, Bass, Tope and Mackerel......Plenty of dates available including weekends for whole boat or individuals available so give me a call with some dates and we will try to get you out fishing. Bait and tackle is available so whether you are new to fishing or an old hand we will try get you amongst the fish.....The above pic shows the crew with part of todays catch. Autumn is here with the nights drawing in, a chill in the air and some nice size Whiting now being landed. A few Cod are turning up in the nets along with the odd fish being landed by anglers. Most of these fish are small, up to 3lb but hey it is early in the year and we often see the smaller fish showing up first so a good chance of some better Cod showing up soon. Skate fishing has picked up with good numbers of fish to double figures to herring bait. The water cleared for a few days at the end of September, out came the feathers and a good catch of mackerel came our way along with school Bass and large Pout. The Bass fishing should hold up with a chance of some Big fish that will be chasing the herring and Whiting that are turning up now. Plenty of weekdays are available along with some weekend dates and remember we fish all year with some excellent fishing available with Skate, Whiting, Bass and of course Cod throughout the winter. Pic shows a good catch of Skate for Seans group. The Smoothound fishing has gone into overdrive with plenty of Starry and Common Hounds being caught aboard Duke IV with the best fish close to 10lb. These fish fight hard and pull line off the drag so having it set lightly is important if they are to be landed. The youngsters that have come fishing have been catching their fair share of these fish, always a pleasure to see the smiles when we finally manage to get them in the net. The Bass fishing has been improving with good numbers of fish in the 4-6lb range mostly being caught on mackerel baits. Skate numbers are also picking up with more fish arriving with the Whiting. Mackerel numbers have been very good this year with plenty of fish available when the water clears although the warm, sunny weather has caused algae blooms sending the mackerel off into clear water. As autumn starts the Whiting numbers will increase as the Mackerel move off but with September being the most productive month for large Bass they are the fish we will be mostly chasing along with the Cod we hope will show this winter so plenty to keep us going. The pic shows Jason and his boys who came fishing and landed 2 Bass, numerous Doggies and 6 good Smoothounds all in just a 4hr trip showing that these short trips are not taster sessions but proper fishing trips when out fishing aboard Duke IV. Great fishing today on Duke IV with some fine Smoothounds to 7lbs in the morning on the live shrimp we have been able to source. We then moved closer to the bank and drifted south with small hokkies and feathers for Mackerel, also hooking a few school Bass amongst the Mackerel. Having enough for bait we moved inshore and fished Mackerel chunks landing 4 Skate including a couple of good size female fish to around 8lb. Terry hooked into something that behaved differently turning out to be a nice Bass of around 5lb. Bass numbers have improved lately with Bass being landed on most trips with Terry from Bromley landing the best fish a tad under 8lb. Last weekends trip also turned up plenty of quality fish with Bass, Hounds, Skate and lots of Mackerel being caught. Still dates available for individuals or whole boat bookings. Check out our Facebook page @fishingramsgate1 for up to date reports and pics. Above pic shows Terrys Bass weighing over 7lb. With the good weather we are enjoying we are catching some nice fish, still plenty of Skate with some of the females weighing over 10lb, Bass shoaling around the banks and good numbers of Mackerel when the water clears. Smoothounds up to 10lb putting a nice bend on the rods taking lugworm and squid baits. Crewman Alan has been out with his pushnet so we have live prawns along with a few peeler crabs. Now the Mackerel have arrived the large Bass will follow them giving us the best chance of a double figure fish. We will be looking for Spurdogs and Tope also found on the deeper marks. Still plenty of dates available fishing aboard Duke IV for individuals or whole boat bookings, call me on 07715050851 for more info or to book. Pic above shows Judiths group from Kent who enjoyed their day fishing aboard Duke IV off Margate. Still the Skate keep coming with up to 20 fish a day. Plenty of male fish that make fine eating and some good size female Skate up to 12lb being caught.The females are pregnant so a quick return doesn't cause any problems and she will return to the seabed keeping the males in attendance. Smoothounds are arriving now although to date the size has generally been the smaller fish. A few big uns are around with crab being the best bait. Some large Bass starting to show up with one fish weighing over 19lb being landed on Skerry Belle, only a few ounces below the current boat record. You have to be very lucky to find Bass of this size but they are there waiting to be caught. 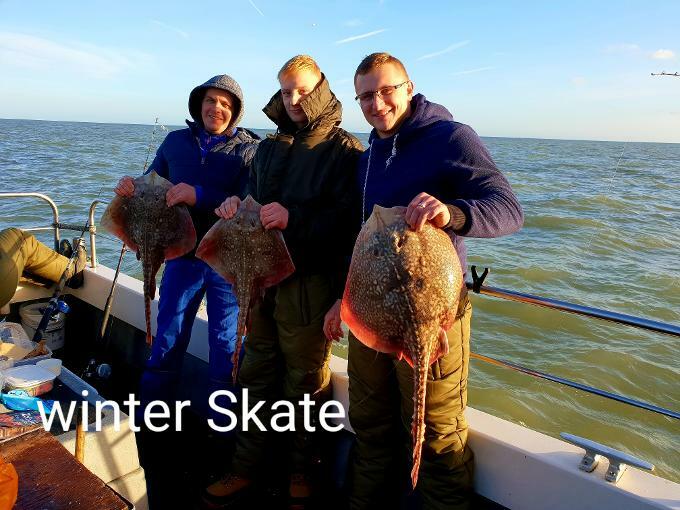 Above pic shows Chris and his lads from Kent who had a good days fishing aboard Duke IV with plenty of action with the good old Skate. Still plenty of dates available for whole boat or individuals bookings so come on... Lets go fishing! Plenty of Skate off Ramsgate with double figure catches often recorded. Jeffs group had 6 Skate Saturday with the best a female of 7lb 8oz. Whiting have also arrived in huge numbers, unfortunately most are on the small size but still plenty to take home. Still a good chance of a Bass or Smoothound, the autumn weather is keeping the water temps high which may explain the lack of Cod although with the whiting numbers rising the Cod cant be far behind. Lugworm for the Cod and Bass while herring remains the best for Skate that are also coming to squid baits. Still some weekend dates available. Pic shows part of Jeffs group catch of Skate. The Belgium fishing club have just returned home following their annual fishing holiday aboard Duke IV. The first day was all action with a good catch of Mackerel and a pile of Skate. That night the wind turned and increased considerably colouring the water and making fishing difficult. We managed to fish but it became harder each day. Derek landed a small Tope and Jules had a fine Bass weighing 6lb 8oz that took a chunk of fresh Mackerel that was caught earlier. Generally the fishing has remained good with plenty of Skate around our area and more and bigger Smoothounds being caught. When the water is clear the Mackerel are here along with Bass on the lures or bait. Forecasters suggest we are in for a hot summer although as I write the wind is blowing 30mph from the North and it feels more like winter than the second day of summer. Looking ahead we should continue to catch plenty of Skate, Bass, Hounds and Mackerel. Always a chance of a Tope,Plaice and Bream and should we ever get out to the wrecks plenty of Cod and Pollack should be on the cards. Still plenty of dates available so call me and lets go fishing. Pic belowshows Lukes 6lb 8oz Bass. Still the Skate keep coming, 26 were landed today by Pauls group aboard Duke IV with many being returned, also some nice Dabs, Whiting and Doggies. Herring remains the bait of choice for the Skate but as the crab peel begins we will see more Hounds and Bass. As summer progresses we will see Mackerel along with many other species so plenty of fish to catch and the weather can only get better so give me a call and come along and enjoy the great fishing out from Ramsgate now. Pic aboveshows Pauls group with part of todays catch. The sun's shining and the Skate are feeding, Rogers group aboard yesterday had 10, the females and smaller fish were returned leaving plenty of wings for the table. We tried for Cod in the morning without luck. April used to be a super month for the Spring Codling, fish between 3and 5lb and although Cod stocks are down we are hoping for some action soon. The crabs will be peeling anytime which will bring in the Hounds and Bass so plenty to look forward to. Plenty of dates still available including weekends so call me and come along fishing aboard Duke lV. Pic shows Rogers group with yesterdays Skate catch. We have nearly completed this years maintenance and will be returning Duke IV to sea soon, all clean and ready to go fishing again. Prices remain the same so still the best value boat around. We will be targeting the spring Cod and Skate with the first Hounds that will be showing soon. Plenty of dates available although the weekend dates go soonest so pick a date and lets go fishing. Plenty of Thornback ray have arrived in our area, Richards group landing 8 with a couple of females pushing double figures on Monday. The Cod have been difficult to find as they have been chasing the Herring shoals way up in the water. They are now thinning out so the Cod should return to bottom feeding making them easier to find. They should be fat having all that food available so we will be hoping for some larger fish. The weather has been making things difficult too with inceccent southerly winds blowing gale force at times but the temperatures are now falling so we should be getting more usual January weather cooler but calmer, maybe some of those cold clear frosty mornings. The colder weather will push the Doggies offshore leaving the baits for the better fish. Plenty of dates available and the prices remain the same as last year so get in early to book the dates you want. Its wet and cold but we're still getting out when the weather allows, plenty of quality Whiting along with Codling, Skate and pout. Still some Bass around on the worm, talking of the worm the supply has improved with more and better available. Still some weekend date's available for groups or individuals so pull on the winter woolies and come fishing. The waters around Ramsgate remain teaming with fish with Bass, Skate, Cod and Whiting. The water changes often with dirty water suiting the Cod and Bass on worm then along comes clearer water with a chance of jigging for the Bass. The Skate fishing remains good with catches of up to a dozen fish per day on the favourite bait of herring although they come up on lug/squid cocktail. We have a glut of Herring in midwater at the moment, this causes the Cod and Bass to feed higher in the water making it difficult fishing for them on the bottom, maybe a live whiting would work in these situations? To sum up yes there are plenty of quality fish out there, catching them is another thing, we just need fair weather to get out there! The fishing just gets better out from Ramsgate. On today's trip Craigs group landed Skate to 10lbs, Bass, hounds, and cod along with some tasty Whiting. Lugworm is the bait for Cod, in large lumps so don't skimp on the bait or they just pass it bye. Herring have arrived replacing Mackerel as the bait for Skate. We were spoiled by the gorgeous weather today which helped the fishing. The Cod have arrived early this year and it looks like we are going to have a good winters fishing. The Skate are spread across the area, the strict quotas giving them protection are working and we are doing our bit by returning most of them we catch. Whiting numbers are up replacing the doggies as the most caught fish, the fillets l had this evening were superb, as good an eating fish as you will find so well worth keeping the bigger ones. Spaces still available for groups and individuals so dig out the winter jacket and come fishing. This winter looks like it could be the best fishing for many years with plenty of quality fish out there! Superb fishing off Ramsgate for now with good size Bass, Skate and Smoothound. The Belgium fysching club enjoyed their week landing quality fish every day aboard Duke IV. They topped off their catches with Skate to 11lb, with Bass and Hounds to 8lb. Most fish came to lugworm with Skate preferring the Mackerel chunks. We have been plagued with dirty water over the last few weeks that has made Mackerel fishing difficult although the water is clearing now giving us a better chance with the feathers, along with the Mackerel a few Bass and gurnard keep it interesting. Now is the best time for large Bass, a waiting game with Hounds and Whiting making up the numbers. The odd Codling now starting to show up so fingers crossed for this years cod fishing that should start in October and go through the winter. The Skate fishing can be good throughout the winter along with Whiting keeping the angler's busy. I like to try the wrecks in September for the Cod that build up prior to coming inshore for the crab and small Whiting that make up their diet. I have spaces left on a wreck trip on Wed 9th September. So plenty of action to be had with space and date's available to book Duke IV. The Hounds are heading south now as they have finished the breeding process for this year, these are fit healthy fish that put up a hell of a struggle when you hook into one as my grandson found out the other day. Marley caught an 8lber on a lug/squid cocktail and was happy to release it. Now is the time for large Bass, these fish can turn up anywhere, but l have some spots where they are more likely, fishing a bait large and tough enough to beat the doggies is the main ingredient to success along with patience, 10lb+ Bass are rare fish now, but with the increasing protection being given to them we may see a return to the numbers we used to get some years ago. All these big Bass are female so returning them is a good idea! Plenty of Mackerel so far this summer although the water has coloured up lately making them difficult to catch for bait, always bring some along just in case. The Skate fishing so far has been superb with plenty all this year, with most of them being released, particularly the females that we have landed to over 15lbs. The Belgium fysching team are back later this month so the fish better watch out, these guys fish hard and always catch plenty of good fish aboard Duke IV! We are having some great fishing around Ramsgate at the moment with shoaling Bass around the banks, today we had a field day with the schoolies hitting the hokkies with gusto, most were small but a sprinkling of 3-4lbers helping us to reach our quota of 3 good Bass per angler easily with lots of fish released. We then moved inshore for the Skate, 3 good fish were landed, all females so they were all returned. Another go with the feathers accounted for a bucket of Mackerel for tea. A move to an area of sand ridges looking for some of the large Hounds that are around at the moment gave us a small one along with plenty of doggies. A good day for the 4 individuals aboard Duke IV today who braved the heavy rain for most of the day. Still space available for individuals or whole boat bookings. See latest pics in the gallery. The fishing just gets better aboard Duke IV with lots of Skate being landed along with Smoothounds and Bass. Still some Whiting and Pout around with the odd Codling making up the numbers. The Skate preference is changing to mackerel although herring remains a good bait. A recent visit to The Varne and surrounding wrecks we caught Bass, Pollack, and Cod. The Mackerel were a bit thin on the ground, unusual for the Varne. Fisheries concern over the stocks of mackerel is right as we would have expected to catch lots but this was not the case, very few off Ramsgate also for now. Plenty of dates available for groups or individuals including space on a wreck trip on 25th June. Great fishing for now with good numbers of Smoothounds and Skate. The Belgium fishing club came to Ramsgate last week landing Skate to 12lband Hounds to 10lb. The cooler box was filled to the brim when they left with prime fillets. An evening trip with Jez group from Thanet had good sport with Skate and Hounds taking them on Mackerel and worm baits. A small Tope came to mackerel bait. With spring comes a fresh run of fish, the Skate are all over our area and the Hounds are running, looking for the crab that are peeling right now. We have been getting great catches recently on the very popular individuals trips with up to 15 Skate in a day along with Smoothounds, Whiting and the odd Codling and Bass. Herring remains the most reliable bait for the Skate with crab being best for the Hounds although lugworm remains effective for all species, probably because the best of the fishing has been within 3 miles of land. The Cod are now moving offshore and will settle on the wrecks feasting on the pouting etc, packing on the weight, we also will be hoping for a good run of Pollack this year, great fighting fish to compliment the Cod. We will be looking to head offshore now to the wrecks and have space on the 28th May. Spring is finally upon us despite the cold easterly wind persisting. Herring shoals are arriving along with Skate and Bass. The Codling are starting to thin out as they move offshore. Once the weather settles the fishing should improve with the shore crab peel. The fishing to date has been hit and miss, one day plenty to catch the next being quiet. This weekend we have found plenty of fish with Lee's group from Essex landing Skate to just under 9lb along with a mixed bag of doggies and Whiting. The recently introduced protection for Bass and Skate will hopefully improve fish stocks giving us good fishing throughout the summer so dust off the rod's and let's go fishing! At last the weather has been good enough to get out and despite the conditions deteriorating throughout the day we manage a reasonable catch with Codling and some quality Whiting. There are lots of Herring passing through at the moment, this of course draws the Cod up in the water making them difficult to catch. Skate are arriving now also some big Bass being caught in the nets, again they are more interested in getting to wherever they are heading than feeding but if there, they are catchable. Despite the cold wind, summer is around the corner, the crabs will be peeling and the Hounds will turn up along with Bass and Mackerel feeding on sandeels so lets make the most of this spring Cod run that should last through April when they will move offshore and settle on the wrecks hopefully giving us the best chance of Cod for some years. Fishing remains good with plenty to catch provided the weather allows us to get out. Codling around in good numbers along with Skate and Whiting, sprats are starting to show so may draw the Cod higher in the water making them difficult to catch. Skate however will stay the bottom so still good size fish to catch. still have spaces available on the 31st of January trip. Call me to book your place. Hoping for good fishing throughout 2015. Plenty of fish out of Ramsgate for now with Whiting, Doggies, Skate and Codling, still around are Bass and Smoothounds. Lots of bait needed as these fish are hungry. Chris' group had a good day on Saturday with 8 Skate to 9lb along with lots of Whiting to 2lb Codling, Bass and a small Hound. December through January is the time for better Cod so big baits of squid or cuttle are worth trying, dont forget the herring though as the Skate will stay around throughout the winter. Wrap up warm, bring plenty of bait and enjoy a days fishing with plenty of fish although not all as large as we would like. to 10lb being fairly common. Last Saturdays group of individuals had a busy day with all species coming aboard Duke IV with Kym from Bedford an accomplished Carp angler leading the way with 3 Skate to 9lb12oz, a female that she sportingly returned to fight another day. Bass & Smoothounds are heading south through our area and always nice to get a few summer fish amongst the winter species although we are concentrating more on the Cod that are on the wish list of most anglers. Baits to bring along are Lugworm & squid for the Cod with herring for the Skate & Whiting. Lots of Skate coming through our area with some onboard getting up to 5 in a day. Taylors group had l3 Saturday along with a nice Hound while Sundays group found the fishing a little harder ending the day with 3 Skate. The favourite bait remains the herring although many taking small squid baits. Along with the Skate some nice Whiting and School Bass. The Cod are coming in with lug/squid cocktails the bait of choice. The warm weather is keeping the water temps high for this time of year although the mackerel seem to have all but left our area now, with herring starting to show on the sounder, making them a fine bait for most species. Lots of small Codling around this summer so hopefully they will pack on some weight and give us good fishing throughout the winter along with the Skate that stay around all year. The Belgium fishing club have just left to return home with their freezer quite full of fish, the majority of which were Skate along with Bass, Hounds, Whiting and Dogfish, apparently a favoured fish in Belgium. The Mackerel are thinning out being replaced by Whiting so we know winter is on the way, the cooling water should bring in Codling along with Skate that are around in good numbers now. Bass will be around until November as they migrate South to warmer water so plenty to catch, we just need the weather to stay fair to get out there after them and we are planning to keep fishing through the winter so call to book your trip. The rain is pouring down outside as I write, with todays trip cancelled. Yesterday though the weather was better and the Mackerel came in thick and fast. A few Skate inshore with a good chance of a large female on the cards. Smoothounds will be heading out of the estuary on their migration back to deeper waters and we look to catching a few on squid or crab baits. Great fighting fish they are too having packed on the weight feeding on crab following breeding. Bass will also be heading back to deep water, with plenty passing Ramsgate. The Whiting are arriving now giving us lots of fish but not as large as some prefer, think of the small ones as fodder for the Bass and Cod so usefull in fattening up the better fish. Lots of small Codling through the summer so hoping for some a return of these fish in the 3-5lb range later in the year. Check out the gallery for the Lobsters we landed while backed up to a wreck last week, you never know what could come up next, such the magic of seafishing! Still good fishing to be had with some quality fish although sometimes some effort required to catch them. We have landed some nice Bass on the long distance trips along with huge Mackerel over 2lb. Yesterday Scotts group had it tough with more wind than was forcast but all landed fish with Andy catching the Bass pictured on live sandeel. A few Codling to pirks and feathers at the edge of the banks and Plaice higher up the bank. Inshore fishing producing some nice fiesty Hounds, Skate & Mackerel. Now we are hoping for the arrival inshore of the large Bass, fish to over 12lb can be caught off Ramsgate. This can be a waiting game using large mackerel baits but the reward being a fish of a lifetime makes it worthwhile for the lucky angler who sticks it out. The fine weather has allowed us to travel offshore where we have found good fishing on The Varne Bank with some nice Bass on live sandeels and pirks. Darrens group did well on the wrecks landing 20 Bass to around 4lb. Marcs group found the fishing a challenge with a strong tidal flow and swell but jumbo Mackerel and Bass made up for the tough day. Terrys group from Sheppey managed a couple of Bass from the wreck along with some on pirks on the bank edge. They also landed some nice Gurnard and Codling along with a good haul of Mackerel. Inshore has been encouraging with some nice Smoothounds to lug/squid cocktails. Still a few Skate and quality Bass being landed so plenty to fish for. Given continued good weather the inshore fishing should improve with more Bass and Mackerel shoaling on the banks to Hokkies and feathers. Darrens group fancied a day fishing for Bass so with a good forcast along with a spring tide we headed offshore. After catching sandeels for bait we began by drifting over the wreck. The Bass fed well on the eels making the decision to spend time catching them worthwhile. Along with the Bass a couple of Pollack took a likeing to the eels. Mission accomplished! Last weekend Orla and Ether brought their parents fishing and useing there tiny rods landed some fine fighting Doggies while Dad had a nice Skate. Mackerel not as prolific as we would expect at this time of the year, but with fine weather and clear water we should see more coming through our area. With continued fine weather prospects look good for fishing around Ramsgate. 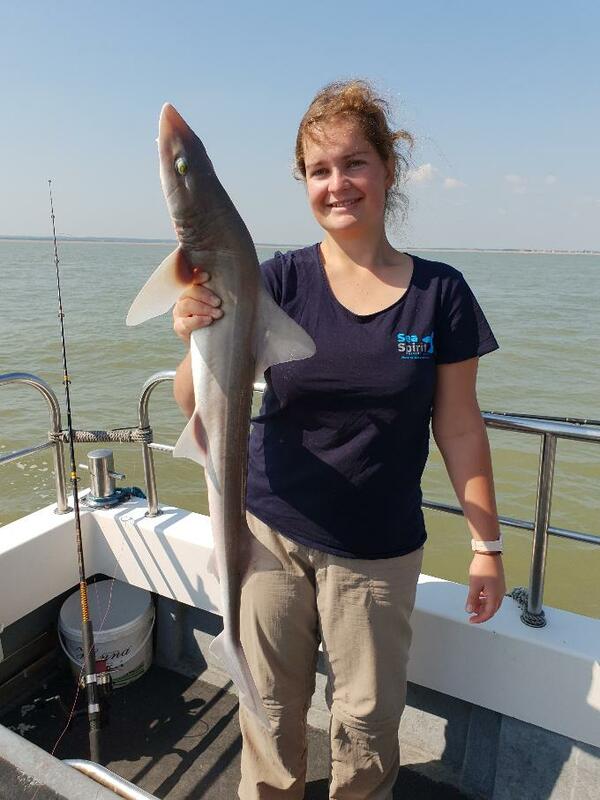 The Belgium fisching club have been back to Ramsgate fishing aboard Duke IV for the last few days, taking advantage of the super fishing we are enjoying lately with plenty of Skate, some fiesty Smoothounds and a good sprinkling of Bass and Whiting. Herring remains the bait for the Skate although they are starting to aquire a taste for Mackerel. The Hounds favour the crab and the Bass lugworm. The water remains coloured with the last of the may water but as it clears the Mackerel should arrive. I have space this Saturday 24th so if you fancy a dabble give me a call and make the most of the weather and the good fishing we are enjoying. Great sport with the Smoothounds now with Marcs group landing l5 last Saturday, Marcins group today landed Hounds, Skate, quality Whiting and Gurnard. The Hounds have a particular taste for peeler crab bait, although we have been catching them on lug, herring and squid so the early birds are hungry and feeding on anything that's going! Plenty of Skate around now with a good chance of large catches, herring remains the bait of choice but a good chunk of squid often works well. A few Bass being landed so hopefully more on the way, lug a good bait with hokkies and feathers good when the water clears. We are gearing up for the wreck fishing now hoping for Cod, Pollack & Bass with space available on 24th April. This time of year can be seen as the pinnacle time for fishing with new fish arriving all the time whilst still plenty of chunky Whiting and Codling still around! The inshore fishing here at Ramsgate is now improving with quality Skate in most areas, along with plenty of Codling, these fish are small but give us hope for the future. Smoothounds, Bass and Mackerel are arriving now and will offer fine sport over the next few months. Still lots of herring showing on the sounder so plenty of fodder for the large Bass that are heading our way, always on the lookout for an easy meal! Herring has been the bait of choice for the Skate throughout the winter but as summer moves on they will be looking for mackerel. Squid remains a good bait for most species and the Hounds are very partial to a whole one and when the water warms sufficiently the crabs will peel giving us more bait choice! The school Bass will be shoaling on the banks, great fun on the feathers or Hokkie lures. Clear water is a must though and the winds we are getting can stir up the water, then the humble lugworm becomes the better bait! The wreck fishing season starts soon and we will soon be out there drift fishing jellies and shads for the Cod, Pollack and Bass. Still some weekend dates available and each Thursday for individuals, so dust off the rods and come fishing aboard Duke IV. Duke IV is now back on the mooring, all spruced up and ready to go. Unfortunately the weather has had other ideas and we are waiting for some improvement and the wind to drop. There appears to be a good run of Spring Codling along with plenty of Skate and quality whiting running through our area now so when we get out we will hope to have some good sport! Bait required will remain the same with Squid, lugworm and herring being the best options but always bring other baits as you never know what the fish prefer on the day. When spring finally shows the Bass will be heading our way along with the Smoothounds and Mackerel so with the days stretching out and fish coming in we can look forward to some good fishing. Plenty of weekend dates available still but the phone has started ringing so if you have some particular dates in mind booking sooner rather than later will be best. Plenty of fish still around although not always the species we all want. Whiting of all sizes with Dabs and of course the Doggies keep the rods moving. There are some Cod around but thin on the ground so proving difficult. Still the odd Bass and Skate to be had so plenty to try for. Duke IV will be lifted out for maintenance mid Jan. Hopefully there will be a Spring run of Codling to go for along with Skate and the first of the seasons Bass when she's launched again in Feb.
Merry Xmas and Happy new year to all our clients old and new. Hope to see you 2014. The winter storms will be bringing in the Cod & Whiting, problem being its the weekends when the wind blows the most. Huge shoals of Herring around now making great bait for the Skate but lifting the Cod off the bottom making them difficult to catch on rod & line while the netters clean up. Still plenty of Bass around but again they are chasing the herring. Thankfully the Skate are quite happy on the bottom and are our main catch at the moment along with Whiting and Doggies. As the herrings move on so things should return to normal giving us a better chance with the Cod & Bass. Winter baits remain squid, lug & herring with crab being a fine bait if you can locate some. See latest pics in Gallery and contct Bob by phone or Email for more info or to book a trip! This mild weather must be confusing the fish as much as the birds. Still a few Hounds about along with Skate and Whiting. The Cod have arrived with a few fish being caught inshore already. The herring shoals are begining to show now so they will make a good bait for the Skate, the Whiting also like a strip of herring or mackerel. Still some large Bass around so worth persevering with a small livebait. Lug and squid cocktail will still be the bait for Cod or if getting too many dogs try a whole squid or two, make sure the hook point is showing to avoid missing the bites. Good Skate fishing today for the crew with Amy landing the best one just under 9lb on mackerel bait while Lee landed 3 to 6lb on lug/squid cocktail. Mario from Bexhill landing a 5lb'er on Squid. Also some good whiting falling to fish baits. Good prospects ahead for this winter with plenty of Skate to herring and hopefully some good Cod to squid. Just call me to come fishing aboard Duke IV and join in this fish fest! Autumn is definately here now, the Whiting are arriving in numbers, these fish are being followed by the large Bass as proved today by Hienric's 13lb 12oz specimen. The crew over from Belgium on a weeks fishing holiday aboard Duke IV. Along with the Bass a good catch of Skate and Whiting kept the guys minds off the damp weather. A run of Skate is the norm at this time of year, these fish are very welcome along with the winter Cod that should arrive inshore early next month. Hienric landed todays Bass on a daisy chain of mackerel chunks with the fish taking a squid on the last hook. Shows its always worth trying something different, smiles all round when the Bass rolled into the net after a good scrap. We have been landing the most superb Mackerel off Deal lately, these fish are feeding on sandeels, so prevelant at the moment. Great sport for the youngsters and the finest eating fish around. The bait requirements for the day become easier in winter with Lug & squid for the Cod & Whiting and herring for the Skate. Cuttle can also prove useful for the better Cod, this bait is not the favourite food for the doggies so more likely to be there when the Cod turn up. Still space available on Duke IV for groups or indivduals. The days are drawing in and the Whiting have arrived in numbers, many are small, making good feed for Bass and Cod while the larger ones make a fine meal for us, fried in a light batter. A fresh run of Skate will arrive during autumn and stay with us throughout the winter, they can be caught on herring that will also start showing soon. The Hounds are moving offshore now and will take crab bait as they leave. A recent visit to the wrecks proved tough with a northerly wind making fishing difficult although some nice Cod and Pollack were landed by Harry and Phil. With continuing good weather trips offshore can prove worthwhile with Cod stopping off on the wrecks as they come inshore for the winter. Mackerel fishing remains excellent with some real beefy fish feasting on the sandeels, great for the bbq. Looking forward, the fishing should remain busy with lots of Whiting along with Cod, Skate and Dabs and of course the ever present Doggies. The inshore Skate fishing remains good with some large female fish around, with fresh Mackerel the bait of choice. The weather has been generally good allowing us offshore although the inshore fishing has been better with plenty of Smoothounds when crab bait is available, they will also take squid or cuttle bait. Bass fishing is improving now with the big girls following the mackerel shoals, now is the time to fish the big mackerel baits, battle through the Doggies to land the fish of a lifetime. Last weeks individuals trip turned up some fine fish with Lee landing 4 good Hounds to 8lb along with a nice Tub Gurnard on crab bait while Jamie's group landed 5 Skate to 9lbs on mackerel strips. The offshore wreckfishing is slowing now with just a few Cod & Pollack, maybe the unusually warm water is getting too much for the coldwater loving Cod. A visit offshore yesterday proved tough with young Lou saving the day with a nice Cod & Pollack to a black & red jellyworm to go with Jumbo Mackerel on the banks. The water will soon cool and a fresh run of Cod should arrive for the autumn. Weekday and some weekend dates still available for groups and individuals so give me a call and come fishing off Ramsgate before this glorious summer ends. The fine weather has reached Ramsgate at last and the fish are arriving with it. Skate Bass and good Mackerel fishing are on the menu along with a few Hounds. Students From Royal Alexander & Albert School enjoyed the day aboard Duke IV with Mackerel, Doggies and a couple of large Skate giving Matt and Bailey a good workout. Josh and Paul were busy all day with Mackerel and Doggies with all catching plenty of fish. Today saw us out on the wrecks with a good haul of plump Cod to double figures favouring the shads to the jellies with Will landing the best Cod that was also the lst of the day at a shade under l2lb. A short stop at the banks on the way home drifting worm saw Will land a fine Plaice with a few Mackerel to go with it. Now the Mackerel are showing in numbers this bait will be the one for the Skate with Hounds still looking for crab. A few Codling still showing inshore feeding on small crabs, unusual so late in the year but a nice addition to the catch. The inshore Skate fishing remains good with some unusally large male fish around with herring still the bait of choice. The weather has been making life difficult for all the boats but Duke IV managed to reach the offshore wrecks yesterday and although the fishing was tough we ended the day with a reasonable haul of Cod to 8lb. Perseverence proved the key to success with the crew finding best results on small shad lures. Smoothound fishing still good with some quality fish, crab being the bait of choice for these hard fighters. July and August will see large Bass looking for the Mackerel and Whiting. Whole Squid or a large mackerel fillet is the way for the big girls although the Doggies also find these baits tasty and can eat their way through a lot of bait, fish a live bait when the water is clear for best results. See latest pics in gallery! Superb Skate fishing off Ramsgate at the moment! If you have never caught a Skate or want some great light line sport, now is the time to come down here. Heindrics Belgium fichting team are enjoying great sport aboard Duke IV for the week with Skate to l3 lb 8oz along with lots of Skate, Smoothounds, Spurdog, Tope & Dabs etc. Still good Cod & Pollack to be had from the wrecks when the weather allows us to get there. Inshore Bass fishing remains patchy, maybe the cold weather holding them back but we look set for a few months of good fishing ahead. Still some weekend and plenty of weekday slots available so if its your first time or your experienced give me a call and come fishing aboard Duke IV for the best service around. At last the water is slowly warming enough for the crabs to peel and the summer species are starting to show, with good numbers of Skate on the banks and the first Smoothounds being landed. We made another visit to the wrecks with Andys crew from Kent who saw plenty of quality Cod being landed on the old favourites jellies and shads. No Pollack on this trip though, perhaps another species under pressure from commercial overfishing. A stop on the banks on the way home saw a reasonable catch of Mackerel to feathers and hokkies, again these fish are not in the numbers we used to catch nor are they as large, hopefully the shoals will build with the jumbo Mackerel being the most superb eating fish around. The Bass are keeping a low profile so far but they should arrive anytime now with plenty of sandeels on the banks, the crabs peeling and the last of the Whiting still here, there's a feast of food waiting for them. Still some weekend dates available to book Duke IV so give me a call and come along for a great fishing experience. At last Duke IV has been able to get offshore to the wrecks off Ramsgate today and the chaps from Daggers deep sea anglers caught plenty of Cod on jellies, shads and all sorts of rubber lures. Micky had the best of the day a shade under 11lb, not bad for so early in the season. Just one Pollack today for Kev who also landed his PB Cod and a nice Plaice when we stopped to drift lug over a bank on the way home. Plenty of Skate inshore along with the first Smoothounds and Bass so its all happening out from Ramsgate. Still taking individuals each thursday and some weekend dates so for the best in fishing and the best value come along and try us out. Check out the gallery for latest pics! 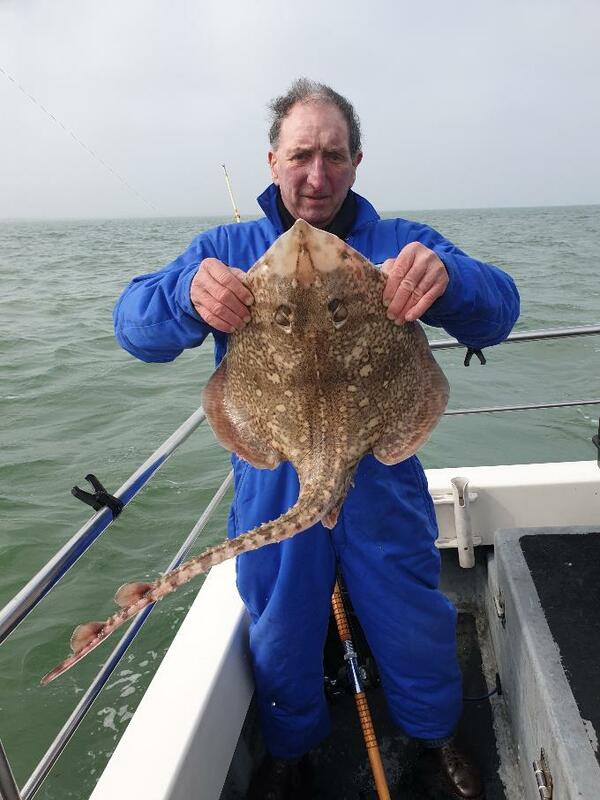 The inshore fishing here at Ramsgate is now improving with Skate in most areas. Smoothounds, Bass and Mackerel are also arriving. Still lots of herring showing on the sounder so plenty of fodder for the large Bass that are always on the lookout for an easy meal! Herring has been the bait of choice for the Skate throughout the winter but as summer moves on they will be looking for mackerel. Squid remains a fine bait for most species and the Hounds are very partial to a whole one and when the water warms sufficiently the crabs will peel giving us more bait choice! The school Bass will be shoaling, great fun on the feathers or Hokkie lures. Clear water is a must though and the constant winds we are getting can stir up the water, then the humble lugworm becomes the better bait! The wreck fishing season starts now and we will soon be out there drift fishing jellies and shads for the Cod, Pollack and Bass. Still some weekend dates available and each Thursday for individuals aboard Duke IV. The days are stretching out, its slowly warming up and the fish are moving. We are now looking for the spring run of Cod this area is famous for. The fish move inshore to feed on the crab, whiting and small squid that are moving into our waters, so there is plenty of feed to attract the fish. We will be shortly begin offshore wreck fishing, looking for Cod, Pollack and Bass, drift fishing the wrecks with shads, jelly worms and hokkies. pick a small tide with good weather and enjoy the day. Duke IV will be back fishing Saturday 23rd following a couple of weeks out for maintanance including antifouling a few repairs and a good clean up. All this to keep us number one in getting you out fishing as quickly and safely as possible! Good Skate fishing off Ramsgate with fish from 3lb to 11lb 12oz being landed aboard Duke IV. Tobys group on Thursday got amongst the doubles with 2 females, both released to lay there eggs and fight another day. Rob & Chris from Herne Bay also got amongst the Skate along with a Cod to Rob on Friday. Today Steves group from Maidstone came armed with plenty of herring baits and had a fine haul of Skate again returning the females, still taking home plenty of wings. Lots of Whiting and some large Pout made up the numbers. Plenty of dates available from the 24th Jan so please email me for bookings for when the Spring Cod run starts. Plenty of fish off Ramsgate with Whiting, Cod & the ever present Thornbacks. The cold weather weather has pushed the doggies offshore so now is the time to try for the big Cod with large squid or cuttle baits. A live Whiting is always worth a fish as they make up the majority of food for large Cod. Shoals of Herring showing up on the sounder and the Cod will follow these shoals, fattening up in the process. Space available this thursday so if your fed up with Christmas come along for a dangle. Alan landed this superb thornback Ray (See Gallery), could make an alternative Christmas lunch. Happy New Year to all Duke IV clients. Fine fishing to be had around Ramsgate with good numbers of Thornbacks moving into our area at the moment along with Cod, Whiting and Pout. We just need the weather to calm down to get out there. Bills group on a works outing yesterday had plenty of action with some quality Whiting to go with the Skate. Herring proved to be the bait of choice for the Skate with lug/squid cocktails for the Whiting. To catch the Cod requires large squid or cuttle baits to avoid the attention of the smaller fish, with the Whiting on the baits as soon as they hit bottom or rig one as livebait, always a chance of a large Bass or lunker Cod taking the bait. The Skate fishing will continue through the winter provided the netters don't hammer them and the Cod fishing should improve until the Sprats arrive in January lifting the Cod off the bottom making them even more difficult to catch. We will continue our Thursday individuals trips throughout the winter so call to book your place or book Duke IV, 6hrs for just £300 for up to 10 fishing. Autumn has arrived with plenty of Whiting, a few Codling and Thornies to be fished for. The Doggies are around in huge numbers too. So plenty of fish, just got to sort out the better fish! Also the summer species Bass & Hounds are passing through on there way South. If the weather eases up the water may clear and we can try jigging for the Bass that will be around well into November. Lets hope this winter will be a good one for the Cod, a few being caught already, most being small but that is normal with the better fish moving in this month. The last couple of winters have been tough with the Cod feeding on the large shoals of Herring and Sprat that have been around, no signs of them yet so maybe things will return to a more normal winter with the Cod feeding on the crab, this keeps them bottom feeding giving us more chance with our baits. So plenty of fish to catch this month with a good chance of a quality Cod or Skate amongst the Whiting and Doggies along with Bass and Hounds still around. The speed of Duke IV allows us to fish many different marks in the day giving you every chance of good fishing! Interesting fishing on Duke IV at the moment with plenty of species around now with Bass and Smoothound inshore along with Whiting, Skate and Mackerel. Offshore where the water is crystal clear there are still some cracking Cod to be had from the many wrecks off Ramsgate. The fishing has been tough at times with the Cod numbers reducing as autumn approaches but the group last thursday stuck at it and kept fishing the lures, catching a fish here and there, slowly making up a good catch of quality fish including a nice Black Bream for Tom, that took his jellyworm. Inshore the coloured water we have been finding lately makes it difficult catching mackerel for bait and having to rely on frozen does not help with the Skate fishing. These fish will be moving inshore now for the winter, they keep the fishing interesting along with the Cod and Whiting that are more expected as the temperature drops. Whiting numbers increasing now, they can be frustrating grabbing the Smoothound and Bass baits but these fish make up the bulk of the large Bass's diet so always worth trying the small ones for bait. Duke IV will be fishing throughout the winter including our popular thursday trips for singles and small groups and our prices remain the same as last year so just call to book your place on a fast modern Charterboat that gets you fishing quickly and comfortably. We are enjoying some good fishing here at Ramsgate at the moment with many species available. Good numbers of Bass and Smoothounds with a few Thornbacks being landed. Heindrics crew over from Belgium had a good 5 days with plenty of Bass up to 6lbs along with Hounds and some nice Skate with Luke landing a sizeable Turbot. These fish often show in the nets but not often to the rods so a nice surprise on mackerel strip. As usual catching mackerel for bait has often proven difficult with coloured water and a lack of fish to catch being the problem. We have substituted whiting for livebait getting good results then they too became more difficult. The Hounds are now moving out from the Estuary so a good chance of picking up some of these fine fish with crab being the favourite bait but lug/squid cocktail baits work well although the Doggies also relish this bait so they can be a problem. Terry caught a nice Hound along with Bass and Whiting on individuals day last thursday and Brians crew fom London today managed Hound and Skate with the Whiting and Doggies making up the numbers although 3 hours on a favourite Bass mark without a fish was unfortunate with only Doggies and a Hound being landed. Our last trip to the wrecks was good with some nice Cod and Pollack to the jellies and shads until the increasing wind made fishing impossible and we had to head inshore where the crew managed Skate and Hounds along with the Whiting and Doggies. The wrecks should continue to fish well through September, weather permitting and we will be looking for some more and larger Turbot also Black Bream that arrive here around this time. Large Bass should be here in numbers for the next couple of months although being thin on the ground up to now has been disappointing, perhaps the lack of mackerel has been the problem or maybe the massive overfishing of this species by the commercial fleets that must be reducing their numbers. 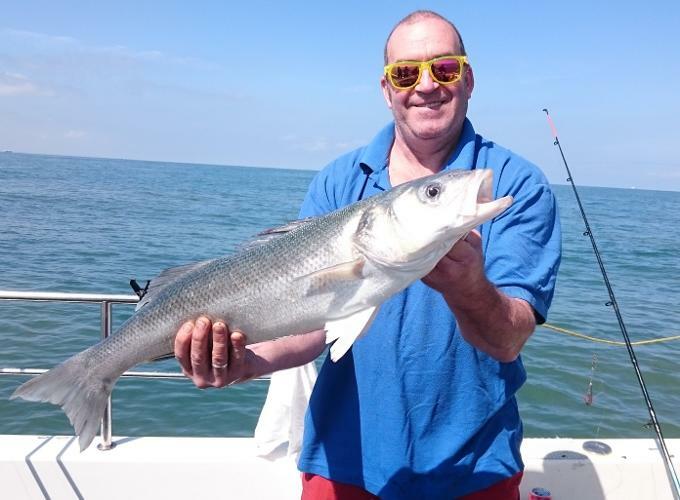 Dates available throughout September for individuals and full boat groups on Duke IV so come along and enjoy the varied fishing we have available around Ramsgate. The fishing here at Ramsgate just gets better with Hiendricks crew over from Belgium on a 5 day fishing stint aboard Duke IV. Jules a lively 78 year old started the fish feast with a couple of nice Bass on live whiting, Heindrick followed with a larger fish on a similar rig. After landing a few more and losing a few we moved out to have a go for the Skate using the fresh mackerel we had feathered earlier. We managed a couple of fish fairly quickly. The crew had opted for a 6 hr day and just before anchor up the guy fishing the stern hooked into a serious Bass that led him a merry dance that ended when the hook length parted just before we could get the net under the double figure fish! Still some weekend dates available in September so don't miss out on the fantastic fishing this autumn. For comfort, speed and a great fishing experience book Duke IV. Sunday 22nd saw us heading North, starting the day feathering Mackerel for bait. Along with the macks came a Gurnard, the cloudy waters made the mackereling hard but we ended up with enough for bait so onto the roads for Smoothies, Whiting, Doggies and a nice Bass for Steve. another move to the sands for Skate and a lovely little Turbot with most fish returned by Davids crew from Herne Bay. Today we headed out to the wrecks where the building NE breeze caused the sea to pick up but the crew managed some tasty Cod before we were forced to head for shelter behind the Goodwin sands, stopping off for some Mackerel on the Falls bank. The fresh mackerel made for good bait with Olivia landing her first Bass and Sam landing a nice Hound. Not huge fish but certainly plenty of species around at the moment giving some interesting fishing! his first Cod, a fish around 6lb that could not resist the black n red jellyworm. Today with the weather much better than forcast we headed north with Gregs group on a corporate day. Plenty of fish were landed with the doggies being thick on the ground. Greg landed a School Bass followed by a nice Skate. The wind then picked up and we headed inshore where Darren landed two nice Bass in concecutive casts on mackerel chunks. We headed further inshore for some Mackerel and a small Gurnard. We are enjoying some fine fishing on Duke IV out from Ramsgate with some good Skate, Bass and Hounds inshore whilst out on the wrecks when we can get there we are landing plenty of Cod along with a sprinkling of Pollack. The wind is causing problems by stirring up the water, just as it clears from the last blow. This breaks up the Mackerel shoals making them difficult to catch for bait, the Skate and Bass much prefer fresh to frozen mackerel so always worth the effort to catch some. The Cod & Pollack seem to favour sandeel type lures on the wrecks greedily engulfing them so there must be plenty of fish competing for the baits. Last thursday gave us a weather window and we were able to get out there with a crew of individuals who had a great day landing fish all day with Steve landing a large Tub Gurnard that took his pirk and Danny landing a lovely dark Cod pictured in The Gallery! Good shoals of Mackerel have arrived at Ramsgate, bringing their predators with them. We have had Tope and some cracking Bass with Will on an individuals day aboard Duke IV showing the way today with two nice Bass on consecutive casts on the old favourite lug tipped with a squid head. The weather has been playing games with us, one minute the suns out then claps of thunder and the heavens open. Along with the above we have been getting some good catches of Skate with Brians crew from London landing twenty between just four anglers. Some big Smoothounds around too although these fish, like the Bass, very mobile, here today gone tomorrow. Thats what keeps the fishing interesting, you never know whats gonna be on the end of the line, just keep an eye on the rod, these fish are quite capable of pulling the rod over the gunnels. See the pics in the Gallery inc Will with the two Bass. Well done shipmate! The inshore fishing fishing here at Ramsgate is now at its best with Skate, Smoothounds and Bass. Mackerel are also here in ever increasing numbers. These fish bring with them the large Bass always on the lookout for a mackerel meal! Herring has been the bait of choice for the Skate throughout the winter but as summer moves on they are also looking for mackerel. Squid remains a fine bait for most species, the Hounds are very partial to it! The school Bass are shoaling and great fun on the feathers or Hokkie lures. Clear water is a must though and the NE winds we are getting can stir up the water, then lugworm become the bait of choice! Andrew's group fishing on Duke IV today landed Smoothounds, Skate, Mackerel and Bass! Still some weekend dates available on Duke IV! We are currently enjoying some great fishing around Ramsgate with Cod, Pollock & Bass on the wrecks and the inshore fishing has improved with Skate, Smoothounds and Bass. As is always the case here these fish are keen not to be caught so plenty of good quality bait always helps. Herring has been the bait of choice for the Skate throughout the winter but as summer moves on they are looking more for mackerel, with squid also working well. The Smoothounds are here for the crabs, but will also take squid & squid cocktail baits. Bass can be caught on any of the above with lugworm a favourite inshore bait for the schoolies and try whole mackerel fillets for the large Bass. We are hoping for a good mackerel year but we need calm clear seas for these fine fish, so far this spring we have had neither! Jamies crew on Saturday had some fine fishing on a four hour trip landing plenty of doggies and Whiting along with Skate & a 7.5 lb Smoothound. On Sunday we sailed to the offshore wrecks with Nordwest sports club where they landed Cod, Pollock & a few Bass along with Gurnard and some Mackerel from the Falls Bank. See pics in gallery. Keep an eye on the fishingramsgate website for coming special trips for individuals and small groups. Regulars Jason & his crew from Hertford Came fishing aboard Duke IV last Sunday. The day started out nicely with a calm sea and we were able to get out close to The Goodwin sands where Jason hooked into a large Thornback Ray. The fish combined with a strong flood tide gave Jason a good workout requiring the removal of his hat due to overheating. After some 30 minutes the stalemate was broken and a near 10lber was landed. See pics in Gallery! A strong cup of tea was needed after this epic battle! Steve managed another Skate before the tide turned & the wind picked up. We headed inshore where the party had a good mixed bag along with a couple more Skate. We have a number of individual days coming up so please contact us for details and join us enjoying the fantastic spring fishing Ramsgate has to offer! Spring has arrived with new water moving north bringing the summer species. Bass, Skate and Hounds are heading towards The Thames Estuary. Most of these fish are not in feeding mood but there is always the chance of a good catch. Ronald along with son Declan landed 4 good Skate today on Duke IV with a mixed bag to make up the numbers with some bruiser spottie dogs. Our first Smoothounds of the season have arrived taking squid baits, now the crab moult will have started soft or peeler crab will be the bait of choice. Still plenty of herring around so they remain a favourite bait for the Skate. Hopefully the weather will now settle down, and we can look forward to some good fishing on the offshore wrecks, drifting for Cod, Pollack and Bass on the lures! The spring run of migrating fish has started with large numbers of Bass heading towards the Thames Estuary, amongst the Bass are Herring and Shad. Still some Cod left inshore and a fresh run of Thornback Ray. The Smoothound will arrive soon with Peeler crab being the bait of choice. We ran out to the wrecks during a break in the weather and although fish were showing on some of the wrecks, due to the coloured water we only managed 1 Cod, this made for a tough day and the dirty water put an end to hopes of Mackerel on the Falls bank on the way back to Ramsgate. So after a difficult few weeks, things are looking up and we are hoping for some good fishing at what should be a very productive time of the fishing year. Check out the Home page for dates of various trips aimed at individuals and small groups aboard Duke IV! Plenty of Codling around at the moment, they are swimming up off the bottom, feeding on Sprat, mackerel and herring. This exposes them to the nets and they are being landed by the tonne! When the herring move off, the Cod will return to bottom feeding over the rough ground. Then its our turn to catch them on lug/squid cocktails. Quite a few Thornback Ray still around with herring being the favourite bait. Carl from Kent, today out on Duke IV landed a chunky l0lb 6oz female off Deal. Some large Mackerel up to 3lb also being landed by the nets so plenty of fish here. We are organising a number of trips for individuals over the next month with plenty of dates also available for the boat. We will be resuming our wreck fishing trips from later this month so give me a call and, Let's go fishing! The fishing just gets better here at Ramsgate with plenty of Skate to keep the rods busy. The Cod fishing could be better but we are getting the odd one here & there. Plenty of Whiting and of course doggies still around. We are still getting the odd Bass to lug bait, maybe this mild winter is keeping the water temps up high enough. Rudy & Martins groups have today had a good haul of Skate along with plenty of Whiting, doggies and a Codling! Still dates available on Duke IV Feb/March so book now to avoid disappointment! Space available for this Sunday for individuals or small groups! A good mix of fishing here at Ramsgate. The weather has been kind with the wind dropping out at last and amongst the Whiting, Cod and doggies we are still having some good catches of Thornback Ray. Herring being the bait of choice for the Thornies whilst lug and squid for the Cod! The sprats are here too but for now the shoals are not heavy enough to make any difference to the fishing. Chris and Rob had a good catch of Codling on Duke IV whilst today Jasons crew from Hertford landed the Skate amongst the smaller stuff. See the pics in the gallery! Bait is still available and Duke IV is ready to go so just call and lets go fishing! Plenty of fish to catch off Ramsgate at the moment with Skate, Cod & Codling along with masses of Whiting. The weather has been kind with light winds and the sun has even come out on occasions. Lugworm bait seems the best method for the Cod, add a strip of squid and the whiting are on it! The Skate fishing is pretty good with herring chunk being the favoured bait. These fish will stay around all winter so if the Cod fishing declines due to the sprat invasion we still have quality fish to chase. Still the summer species abound here at Ramsgate with Bass, Skate and the odd Hound making up the numbers. The water is now though cooling down and taking some colour, looking more like the dirty winter sea the Cod favour. Plenty of Whiting and Doggies to keep the rods nodding while waiting for that elusive Cod. The bait required for a days fishing is much simpler now just lug, squid and some herrings for the Skate. Baby cuttles a great bait for the better Cod as the smaller species are not so keen, leaving it there for the Cod or large Bass that stay all winter. Its a lovely day out here today, bright sunshine and light west winds, making the fishing much more comfortable, we have a nice Skate amongst the smaller fish so looking good with some quality Whiting! Plenty of herring here now so when you bring up a small whiting let it back down, as small fish make up a large part of the Cods diet! Duke IV is fishing throughout the winter so don't sit at home bored, give me a call and let's go fishing! We are enjoying some super fishing out from Ramsgate, the weather has been kind too allowing us to fish places often out of reach at this time of year. We headed south today with Roberts crew from Herne Bay and passing Kingsdown the fish marks on the sounder proved to be herrings that we caught on the feathers. We moved on to the Varne where we had Jumbo Mackerel, Bass and some tasty Turbot, the reason we came here in the first place. We stopped off at a wreck on the way back to Ramsgate where fishing the launce we had caught earlier, Chris lost a fine Bass and Rob landed a Pollack on a sidewinder. Whiting, Bass, Skate and Hounds and the odd Cod closer to Ramsgate so plenty of species to aim for. Looking forward to a busy winter with some weekend spaces still available on Duke IV. Todays trip has been cancelled due to bad weather, a problem we will be experiencing more as we move into winter. A great pity as the fishing has really picked up with good numbers of Thornback Ray arriving. Ian and Richard brought the firm out fishing, some of them for the first time where they managed fantastic Skate fishing with 2 rods bent over at the same time a regular occurence,! We headed out to the wrecks last Sunday with Steves crew from Biggin Hill and although the Cod are moving off the wrecks we did manage a Cod amongst the Pollack. On the way back to Ramsgate we stopped on the Falls Bank and fished feathers on the drift for some large Mackerel. Steve who had struggled on the wrecks showed us the way with a 5lb Bass from the top of the bank. The Cod are moving inshore now and along with the Skate,Whiting and of course the Bass that stay around until mid November should give us the opportunity of good fishing. We are still doing the individuals trips each thursday throughout the winter and can take small groups out midweek at very reasonable prices. Please call Bob for details. We stopped on the Falls bank on the way home and our efforts were rewarded with some tasty Mackerel and launce. The wind soon though picked up and our hours bottom fishing was difficult in the building seas. Inshore fishing has generally been good with plenty of fish to catch with a few School Bass, Whiting, the odd Skate and Smoothound along with of course the inevitable Doggies. With autumn now upon us we will see the Bass and Hounds moving out of the Thames Estuary and the Cod moving inshore from the wrecks to feed on the crabs and small whiting, so although the fishing can be a bit hit or miss as expected at this time of year there is always the chance of being in the right place at the right time and bagging up. The weather has improved and Duke IV has been able to get to some of the offshore fishing grounds and the wreck fishing has been superb with plenty of quality Cod along with a few Pollack and Bass. On the wrecks the Cod have been feeding up on launce and crab. This has fattened them up well with quite a few being into double figures! Pollack numbers have also improved with some also approaching doubles! Most productive lures have been the Redgill/jellyworm type lures! Bottom fishing has been good with lots of species with some fine specimens amongst them. Gary from Hertford landed a fiesty Bass of l0lb l4oz on a mackerel chunk intended for Skate! Some large Smoothounds moving through as they head south for the winter, Dan from Erith landed a fine specimen following a good battle on a light rod. The fun carried on as the hound refused to be netted. We got some nice pics of the fish before Dan carefully released her. The herrings will arrive soon, bringing the winter fish inshore. Will this be a good winter for Cod fishing? Im often asked! The Cod fishing on the wrecks has been productive with a variety of sizes so there must have been successful spawnings over a number of years. Last winter some large Cod were landed so these fish will be well into the twenty pound plus range if they have survived the commercial onslaught! The sprat shoals over the last couple of years have been huge, lifting the cod high in the water making them difficult to catch. This can be frustrating but the Cod and Whiting will pack on the weight as they feed their way through the sprats! Are the Sprat shoals large because the predators are so few compared to say 20 years ago? Probably! The next month should be good with the Bass shoaling and feeding on the pin whiting and the Hounds will be heading out of the Estuary, with the Cod moving inshore to feed on the crab and whiting! Another trip out to the wrecks on 28th July where Kevs group most of who had never wreck fished before landed plenty of Cod and a few Pollack on the boats shads & jellyworms. Colin and Paul also landed a good bag of Cod. We stopped off on the Falls bank for Mackerel and topped off the fish boxes with some fine specimens. Steves group opted for an inshore trip and after catching mackerel for bait we fished the banks and gullys and they caught Bass Skate and some nice Whiting. We headed south with Dans group from Erith and had a fish filled day with lots of Doggies but Dan found a fine Smoothound that took his mackerel chunk bait! Plenty of species to aim for with Autumn and winter fish mixed in with the summer fish. The pin whiting are shoaling so we can hope for the Bass to shoal and feed on them. Just hope the trawlers don't spook em! The weather gods have smiled on us here at Ramsgate and we have been able to push offshore on Duke IV and Gary from Hertford landed a fine Bass of 10lb 14oz on a mackerel bait intended for Skate but not too disappointed when the Bass came along. We had picked up 40 or so Mackerel on the way out so the best bait was available and Bob landed a Thornback Skate before we moved on. The following day being a Thursday was individuals day and the wrecks were calling and we had a great day catching some 60 Cod and Pollack to well into double figures on Redgills, Shads and jellyworms, Brian and Rob managed a Bass each and Brian had two Red Gurnards. We stopped off for some Mackerel on the way in and finished with plenty of fish and an exhausted crew. Rob from Swalecliff sent in the following email. Thank you so much for all your hard work on the 21 July 2011. It was the best days sea fishing I have had in many a long year. I don't think I have seen so many cod caught on a single drift since the late sixties and early seventies, and that continued for most of the day. The Duke IV is certainly an excellent comfortable boat and your skills at finding the fish were first class. I had a wonderful time and was exhusted at the end of the day, but it was a fishing trip I will long remember. I shall certainly look forward to the next trip with you. The summer species have arrived with good sport for Bass, Thornback Ray and Smoothounds. Mackerel now around in numbers some days allowing us to catch fresh bait for the Thornies! July is the time the large Bass arrive and their is no better bait than a large fillet of mackerel fished hard on the bottom, or fished live when the water is clear! Fish lugworm for the smaller Bass or Hokkias or white feathers when a school turns up! Smoothounds can be caught on lug squid cocktail while the biguns like whole squid! We are picking up some good Whiting and Pouting now on the worm and fish baits so plenty of species to aim for, just remember to bring a cool box with some ice packs to keep your catch in tip top condition while taking the fish home! Great Skate fishing right now with numbers of fish on most marks. 8 year old Alex landed a fine 7lb specimen on the boats lightest rod, he was hauling for fifteen minutes while the Thornie took advantage of the strong tide. Step dad Andy also got amongst the fish on individuals day. George on Bank holiday Monday, landed the best Skate of the year so far at l4lb l2oz! We have been getting a few School Bass and Scad while feathering Mackerel for bait. Always a good way to start the day! A few Smoothounds although mostly on the small size at the moment but the bigger fish should be here anytime soon! Some good Tope around now just need the right tide to coincide with some calm weather for some great sport! Despite the weather playing games with us the fishing at Ramsgate is hotting up with plenty of Thornback Ray, Smoothounds, Mackerel and the Bass are starting to shoal. Attilla and his crew from Dagenham had a fine days fishing yesterday leaving Duke IV with bags of fish. It was mainly a Skate, Whiting and Mackerel day with one Skate topping 14lb 12oz! Plenty of space this Thursday for individuals looking for a fish meal! A busy few days with 5 trips in 5 days, really lucky to get such good weather and the fish have played too! Lots of fish for the individuals day Thursday then Friday, Peters crew from an East London pub turned up for a corporate day. Along with the food & drink they caught some nice Thornies and Hounds! On Saturday it was back out to the wrecks with Steves crew from Sheppey and after a difficult start with the first 3 wrecks being quiet we made up for it with a good catch of Cod from the last one Phew!! Sunday brought some wind so Andys crew were disappointed we couldnt get to the wrecks but were happy with the excellent inshore fishing with the Thornies & hounds we managed to find. Monday began with a fine morning so we headed north where we had fish all day with Skate, Bass, Whiting, Codling and some fine Dabs, Mel managed a nice Smoothound to finish the day. See the pics in the Gallery! The NE wind dropped today giving us an opportunity to get out and find some fish! John Hamiltons group from Eltham had a good catch of Skate and Justin released a nice Spurdog of 9lb 12oz caught on squid/mackerel cocktail. See gallery for pics! The fishing has really turned on here at Ramsgate with the Thornbacks arriving inshore and the Cod on the offshore wrecks along with a sprinkling of Pollack. The Bass are heading around the coast on their annual migration north. We had a good catch of wreck Cod on Duke IV for the individuals thursday wrecking trip and followed up with Pauls group getting amongst the Cod and Pollack on the saturday. The weather has been kind too with sunshine and calm winds, very unusual for this time of year but very welcome. The fishing should continue to improve with the Smoothounds arrival, here one day gone the next! Spring has brought some good fishing to Ramsgate! We still have some quality Cod inshore! Paul from Welling landed a fine specimen of l5lb l2oz. The Skate are making an appearance with good numbers available. Ian landed an 8lb'er and Courtney who came along with dad on an individuals day showed how its done with a Skate and Doggies! We have made our first visit to the wrecks with Ben who is opening a new tackle shop in Ramsgate, (Cathedral Baits & Tackle, www.CathedralBaits.co.uk ) and Shane Pullen of Sea Angler magazine! The group had plenty of Cod plus some Pollack! Shane brought a cameraman along and shot some film for his latest DVD which should be available soon! Fred enjoyed his birthday treat with Mitch and mum Kelly with lots of Doggies and Dabs! Ginters group from Barking had a good day with Skate, Whiting and our first Smoothound of the year! See the pictures in The Gallery!The fishing should continue to improve as the water warms, bringing in the Bass and Hounds. Skate numbers should peak in May with the Mackerel arriving inshore in June! Still dates available for groups & individuals on Duke IV so please email or call me for more information! Tight lines, Bob. The fishing appears to have turned the corner here now with some excellent Cod being caught, Paul from Welling had one of 15lb 12oz yesterday on Duke IV and Terry landed a nice Thornback last Thursday, (Check out the gallery). Fish are also showing up on the wrecks, fairly early this year, we just need good weather to get out there! We had good inshore Cod fishing this time last year until late April so lets hope we get the same this year. The Thornbacks are coming in now so don't forget the herring bait, they love it! I have heard of the first Hounds being caught by net so they are heading in with of course the Bass! All these fish are here to be caught, you just have to work for them sometimes, but as the regulars know I will do my best to find them! Its been a tough winter but spring is here and the Sprat shoals are thinning out and there's a lot of Cod out there. They should now return to bottom feeding making them catchable again! There's plenty of Dabs and the Thornback Ray have started to arrive with a few being caught, the Smoothies will be right behind them and as the water warms so the fishing should just get better! There are plenty of dates available for booking Duke IV including weekends and prices remain the same as last year! The wreck fishing starts in April and we will be taking individuals and small groups on Thursdays so looking forward to seeing all the old faces and hopefully welcome some new ones! The boat is fuelled up and ready to go so dust off the rods, sharpen the hooks and come down to Ramsgate, I will always do my best to give you a day to remember! Good fishing here at Ramsgate at the moment with plenty of action! Good Whiting and Doggies along with Skate and Pout. The Cod have arrived at last with quite a few being reported. Richard had a 7lb beauty fishing off Margate on Duke IV, lug and squid being the bait of the day! A good mixed bag with some of the Whiting topping 2lb! We have suffered with wind over the last month, this gives me the opportunity to fish the beaches around Kent with my old fishing partner Rob from Woking Surrey! We have caught plenty of Whiting, Doggies etc from the local beaches but on a visit to the hallowed ground of Dungeness, Rob landed two Cod of 5lb and a fine specimen weighing 14lb 5oz, both caught on Whiting livebait! Sprats are already with us along with Herrings, this gives the Cod a fine feast, great for fattening them up but lifts them off the bottom making them difficult to catch on Rod + line! We have Thornback Ray that stay with us throughout the winter off Ramsgate! Great sport provided of course we can get out to them and they are not fished out by the netters! Lugworm can be a problem at this time of year so best to book in advance and don't forget herring bait for the Rays! Great fishing here at Ramsgate at the moment with plenty of action! Good Whiting and Doggies along with Skate and Pout. The Cod seem to have arrived at last with quite a few being reported. Richard had this 7lb beauty on Saturday fishing off Margate on Duke IV! Lug and squid being the bait of the day! A good mixed bag with some of the Whiting topping 2lb! The wind and rain are thrashing away at the windows as I write this report! I am supposed to be out with a party but hey that's the weather for you! The fishing has been hectic when we have got out with plenty of Whiting, Dogs, pout and a few Skate! The Cod though have been a bit thin on the ground so far this winter, this is not good when we all want to catch lots of biguns. I think things are running late this year and any time now the Cod will arrive and we will wonder what the problem was. The Whiting are good and fat, coughing up crab, shrimp and spratts so there's plenty of bait out there for them! The beach anglers seem to be getting a similar result, plenty of Whiting, not many Cod! We get an influx of Skate at this time of year and they seem to have arrived, as we are catching a few fish on the banks! When this weather settles we can get out a bit further and hopefully the Cod fishing will improve, so plenty of lug and squid the order of the day with a couple of herrings for the Skate! Plenty of dates available on Duke IV throughout December so get those Cod rods out and come on down! Plenty of fish around, loads of Whiting Doggies etc. Getting the odd Bass, although there are plenty still here and they will be until November! Still catching a few Skate and we normally get an influx of them in the Autumn so fingers crossed. The Cod have started to show although not in the numbers we would hope for, perhaps they are a bit late this year but we were getting some good catches by mid October last year so lets hope they are swimming our way. The trips have been good lately with fish being caught all day, we manage this by moving around if nessesary to be in the right place at the right time. The Whiting we have been catching have been coughing up Spratts, sandeels, crabs & shrimp so the sea around Ramsgate is a full larder for the fish at the moment! Getting plenty of ladies and kids fishing over the last few months and I think they along with the chaps have enjoyed the day out on Duke IV. We get some of the best fishing of the year over the winter period here at Ramsgate with Cod Skate and Whiting along of course with the ever present Doggies so give me a call & we will see if we can get you out fishing! Dont forget the individuals trips on Thursdays always a good laugh and who knows you might even catch something! Autumn has most certainly arrived with wind & rain along with reports of the first Cod and quality Whiting! The water has been coloured by the wind so brought an abrupt end to the Mackerel fishing which is a pity as fresh, it is the best bait for the large Bass and Thornbacks that frequent our area! Hermit crabs remain scarce which has been a problem all summer regards the Smoothound fishing that has not been good as would be expected! The Cod should have arrived in numbers by late September, add them to the Bass that will stay around until November we should be in for some good fishing over the next couple of months! Lugworm & Squid cocktail will probably be the best bait for the Cod & Whiting while given some clear water Hokkies & pirks for the shoal Bass! The coloured water will bring the Herrings inshore which will replace mackerel as the top Thornback bait! The odd Tope should be caught with Spurdogs a possibility on the deepwater marks. A Bass weighing 23lb 15oz was landed by a net boat from a local mark so shows that we do have some fantastic fish in our waters, what a catch that would have been on rod & line! Excellent fishing here at Ramsgate with good Thornback Ray and Smoothounds. The big Bass have started to show with a fine pair weighing 8lb 12oz to Sam aged 15 who was in line to win the pool for the biggest fish of the day, some suggested that £40 might not best be paid to such a young lad when Dad Nigel weighed in with a last minute Bass of 12lb 4oz. Nice job Nigel! Both fish caught on mackerel fillet on Ramsgate charterboat Duke IV. See pic in gallery! The weather Gods are smiling on us here at Ramsgate with calm seas and plenty of sunshine, this all makes the fishing so pleasant, the fish are playing ball too!We are getting good catches of Thornback Ray from the many banks in our area, the Bass are shoaling and we are catching some quality Smoothounds.Mackerel are also around but not in the numbers we would expect at this time of the year, this is the second year where they are relatively thin on the ground, could this be due to bad luck or possibly something more serious like overfishing in other areas?I keep thinking of the thousands of tonnes being trawled in the north of Scotland! Could these Mackerel have been making their way south? July and August are probably the best months of the year to try for large Bass using whole squid or large mackerel baits. Pick a large tide and sit in the rips around the North Foreland or up in the Thames Estuary, be patient and you may be rewarded with a double figure fish! Please bare in mind these fish will be females, with huge spawning potential so to return them is a great service to the future Bass stocks and great to see them swim off after a quick picture!Malcolm Andersons crew from Corby landed 17 Thornbacks on Duke IV, releasing most of them unharmed, this followed a tough day on the wrecks so well done chaps, hope you enjoyed your trip to Ramsgate! The water has warmed up, the crabs have peeled and the fish have arrived! At last summer is here! Been out on the wrecks and we landed plenty of Cod and Pollack on Duke IV. A good trip with the individuals Thursday then back out with Crew Lucas from St Albans on Friday. All caught plenty of fish, should keep there freezers topped up till the next trip! Inshore fishing has been good one day then quieter the next, with Thornback Ray, Smoothounds, Bass and some cracking Whiting! Martin's crew from Gravesend had a good day inshore with Smoothounds (all returned) and Thornbacks along with Whiting and Dabs, see pic. The Bass should start shoaling on the banks now, you can't be sure where or when, just be in the right area at the right time, keep your eyes open and have some hokkies in your box! Don't worry we've got plenty on board Duke IV! The wreckfishing season has started here at Ramsgate and blessed with some fine weather we got out there on Duke IV. As with everything in nature it appears that things are running a couple of weeks later than would be normal. We tried a few wrecks before we got amongst the fish! The water is still cool and carrying some colour which is not best for our favoured method of drifting the wreck with lures but after a slow start on both days we got amongst the Pollack, fine hard fighting fish they were too! We also caught a few Cod, not as many as would be expected but I am sure numbers will improve throughout May! Inshore fishing has been pretty good with fair numbers of Skate, the odd Bass and the first of the Smoothounds arriving. Mackeral should be here soon and they will bring their predators with them. Fishing on Duke IV now much improved with the arrival of the summer species. This along with the spring run of Cod and Thornbacks we are keeping the angler’s busy! Also being caught are some quality Whiting and Dabs!Smoothounds and Bass, although mostly small are here and feeding so by moving about we can have a good mixed bag of fish.Some large Bass being landed in the nets, it would appear that these fish are travelling so not interested in our baits, mores the pity!The Cod will be moving off to the wrecks by the end of the month to join the Pollack that will be there already. Shads, Redgills and jellyworms are the way to fish the wrecks here off Ramsgate with Hokkies and pirks on the banks. A Ramsgate restaurant was recently offering local caught Halibut steaks, getting ready to report them to trading standards under the Bulldung heading I was surprised to find that a local netting boat actually landed the fish, weighing 65lb just three miles out from the harbour, this same boat has also landed some good Turbot and Brill, so they are here, just got to get em on rod&line! Jane's family group from Deal, Kent finally got out and enjoyed a fine break in the weather. They managed to catch some nice Whiting and Doggies along with four quality Cod aboard Duke IV. Jane's homemade Pastie was superb,many thanks! I am sure the Cod will taste just as good ! See pic in gallery. Duke IV has just been relaunched following the annual service & we are ready to go! Best of all the Cod & Skate along with a few Bass & Tope have arrived off Ramsgate! Shake off those winter blues & come fishing! Space available throughout April & with prices the same as last year. You know it makes sense!!! Fishing remains tough on Duke IV, largely due to winter refusing to loosen its grip upon us. Despite this the water temp is rising, although slowly! Thornbacks have arrived and we are getting increasing numbers. These fish are disgorging Sprats! just goes to show even Skate will rise off the bottom to feed on these fish when in abundance. Cod remain elusive, maybe they are still high in the water, the netters are not getting many either! The Sprats run between 15’ to 20 feet below the surface and at times appear as a solid mass on the fish finder, although they are thinning and should be gone by mid march?? ?We are catching Dabs and Whiting along with some Dogfish!A few small Bass showing up on the east pier, so they are coming along. So despite the gloom, better fishing is just around the corner.We should have the spring Codling run by now, maybe the cold weather and the Sprats have put this back a couple of weeks, this should run through until late April so plenty of time yet! Not many anglers at the moment so a big thank you to all those that have braved this long and very cold winter, without you the boat would be gone too! We were enjoying great fishing on Duke IV early in Jan with a fish a chuck, Whiting, Pout and Dogs and amongst all this the Cod. They seemed to be very mobile, here one day somewhere else the next. A strong tide stream was when you got the Cod. The smaller fish would slow off and then up comes a Cod then maybe a couple more then back to the smaller stuff, the tide slacken's so we move find a bit more tide and we are back amongst the Cod. Keeps the fishing interesting and we are lucky here at Ramsgate with the English Channel meeting the Thames Estuary and the North Sea on our doorstep there is always a good tide somewhere. Lug and Squid the bait of choice with whole Squid next. Then the sprats moved in! I have never seen them so thick! The sounder would show a constant line of them around 15 feet below the surface and at times the screen would show them as the seabed so thick are they in places. With all this fodder around its hardly surprising that the Cod along with everything else has come up in the water to feed on them, totally ignoring our baits. The fish I think, are here but we cant catch much at the moment. The upside of this situation is that the fish are having a good feed and putting on weight so we can look forward to some good Codding when the sprats move on, this should be anytime now! Where do all those sprats go the rest of the year? Plenty of spent Skate purse’s on the beach so the Skate must be here, although we are only getting the odd one. The weather has'nt helped either, with the water temps dropping to around 41'f. Skate will move into the area in large numbers throughout Feb and March and good catches are possible. They are still an ‘at risk species’ so its good policy to return what’s not required in particular the females, every little helps as they say! Feb/ March will also be the start of our spring run of Cod and if last year’s was anything to go by should be a good one. They should stay around through April, then gradually move offshore to the wrecks. The Bass, Hounds along with all our summer fish will be heading our way by now So to sum up, once the Spratt’s move out we should have some excellent spring fishing to look forward to, so dust off your rods and get down here, do some fishing! Bens group from Eltham had a fine weather day on Duke IV and along with some cracking Whiting they got amongst the Cod. The fish preferred a tip of squid with their lug today. The fish just kept coming and even the sun came out. Happy days! Despite the weather we are getting out and getting amongst the Cod. Lug & Squid or just plain Squid doing the buisiness. The fish are between 5lb To 10lb. Chris Terry & Ric all Duke IV regulars enjoyed the day with these Cod along with some nice Whiting Pout and of course the Doggies. Still a few dates available over the holiday period so come out and test that new gear! November has been an interesting month for the Charterboat Duke IV in Ramsgate. I can't remember a month with so much wind! I have had to cancel most of my planned sea fishing trips and as I look out over Ramsgate harbour its raining and the wind is howling. This weather has though, given me the opportunity to get the beach caster out and I can say that Rob and I caught plenty of fish Whiting, Dabs and the obligatory Doggies we even caught a couple of nice fat Cod from Deal beach the other night so well worth the effort! The fishing when we have got out has been as expected with lots of Whiting and Dabs along with Cod, Skate and the odd Bass. Jo and her friends had a good fishing trip on Duke IV with catch of Cod, Whiting and a Bass. We have had local peeler crabs available in Ramsgate, very late in the year for this area, I suppose the water temperature still in the 50s has encouraged this late peal. The Herring and Sprats have arrived so the Cod are feasting on them, good for packing on weight but not so good for us trying to catch them..
A number of Spurdogs have been caught in the nets so maybe we will be able to catch a few, the law of averages should allow us a spell of settled weather required to get far enough offshore. Still dates available in December and the New year on Duke IV but the boat will be out for a month for maintanance from the 8th Jan. Seasons greetings to you all ! Winter has arrived with a bang with gales and rain, this is the time for Cod along the Kent beaches and out in the boats. Along with them are masses of Whiting and Dabs. The Whiting are not the undersized fish of the last few years but quality fish well worth catching. Good to see the return of the Dab as it is a favourite of many for the table. The Cod are around 5 to 7lb with the odd double and happy to pick up squid & lug baits and with fish of this size they are great fun on light tackle and look just great as they battle it out at the side of the boat. It appears the protection given to the Cod is paying off, they are well spread over our area and of a good average size, this was not the case two years ago so lets hope fisheries keep up the good work and not allow the over fishing that very nearly finished them off five years ago. Bass still around although more likely to be caught by accident while fishing for the Cod but when you hook into one it may well be a bigun. Skate also still around although with all the other fish picking up the baits they don’t get a look .Again, these fish are being protected to some degree and are around here all year with many into double figures. Possibility of a Tope as they pass through or maybe even a Spurdog, a few were landed last winter. A change in the weather from Indian summer to winter has coloured the water and brought in the Cod. Bens group of Firemen from London had a good day with plenty of fish including Cod Skate and some quality Whiting. The wind is blowing again as I write so perhaps the Bass will move out now. The Cod numbers should increase with plenty of doubles if last years fish have continued to grow as they should. We have been catching some fine Dabs lately, a small species but one that has been quite rare for a few years now. The fishing seems to be getting back to that of years gone by when there was plenty of species around with good numbers of large Cod. Its time to dig out the flotation suits & get out fishing! A fine days fishing for Martin and his group from Gravesend in Kent with plenty of Whiting and Large Dabs, Dennis landed a 10lb Cod that made his day. On return to harbour the birds were chasing the Whiting again, this gave us an opportunity with the lures and we managed around 40 Bass to 6lb. The water remains warm and quite clear, perhaps this is keeping the numbers of Cod that we expect at this time of year low? After a long and interesting summer with excellent Cod fishing on the wrecks with good numbers of doubles, we are finding them inshore now early September, this is early and may, we hope, be a prelude to an excellent winter. Plenty of Whiting around, the Bass seem to be chasing these more since the decline in sandeels. Seeing 12oz Whiting being chased to the surface and the herring gulls trying to eat what’s really too big can be amusing as they fight over the unfortunate fish. The Bass fishing has been sporadic, shoaling some days and others can’t find them anywhere with just the odd fish showing. Quality Skate still around just last week we returned a pregnant female of 13lb. Mackerel still thin on the ground, perhaps due to the winds constantly stirring up the water, fresh mackerel the best summer bait for Skate, frustrating when you struggle to get enough. The Bass should stay around until October so on a good day it’s possible to get a Ramsgate grand slam of Bass, Cod, Smoothound and Skate all in the one day ! Fishing remains generally good despite the unseasonable weather, the wind stirs up the water, that’s not good for the mackerel, making it difficult getting them for bait and the Skate love fresh mackerel. Despite this we are still getting a few! Bass fishing taking off now with some good fish being taken. Lugworm the bait of choice with mackerel fished hard on the bottom for the big girls, Chris came close to a double yesterday with the one below caught on mackeral bait. Whiting are still around along with Pouting and the odd Codling inshore. September usually sees an influx of pin whiting, favourite food of the Bass. When the right weather, tides and clear water come together we can enjoy some excellent fishing with pirk and hokkai lures over the rough ground and banks. The Hounds will be heading back out of the estuary, somewhat larger than when they arrived due to a summer of crab crunching, giving some excellent although sporadic fishing. This winter could be good for Cod provided they have survived the summer with last years 4lb average now into double figures and hopefully some 20lb’ers and maybe the odd thirty? Just like it used to be! The fishing off Ramsgate carries on apace with Quality Smoothounds here in numbers. Chris Wards group from London landing 16 to 10lb along with Bass and a solitary Thornback. Daniel Hays group also from London upped the anti with 23 Hounds to 12lb along with Mackerel and the obligatory Skate, both groups fishing on Duke IV elected to return all the Smoothounds bar 1 that was badly hooked. The Bass and Mackerel are still patchy with double figure Bass few & far between, hopefully the big girls will arrive soon with August usually the best month for these fantastic fish. The Cod still on the wrecks although declining in numbers. Pollack will increase in numbers along with Bass and maybe Black Bream to keep the wreckfishing interesting but with the inshore fishing so good, why go wrecking? 14th June: Getting amongst the Thorbacks again with some quality fish. Mark Kingsmills group from Kent having a fine day landing some 15, along with Whiting Bass and dogs. Wreck fishing still good although slowing slightly for the Cod with more Pollack turning up. Mackeral around although the northerly wind stirring up the water makeing them a bit hit or miss. Summer fishing should be at its best over the next month ! Plenty of species available inshore now with Smoothounds, Bass & Thornbacks along with quality Whiting all available. The offshore wreck fishing remains good with plenty of Cod to double figures along with Pollack and Bass. The fishing in the Thames estuary remains top class with quality Thornbacks along with Smoothounds to 15lb. Hermit crab or live shrimp top bait for the hounds, not easy to buy but drop a baited net at slack water and get free bait that will catch all the species in the area. The dreaded may weed has now gone, this should improve the Mackerel fishing that is often difficult here due to the coloured water. The quality Whiting we are catching at the moment are unusual at this time of year, we usually see them late summer, we are also catching them offshore on the Mackerel feathers. Large shoals of school Bass heading up the estuary, here one minute gone the next. Good fishing here at Ramsgate with excellent catches of Thornback Rays from all over the area, some boats catching 16 per trip. The wreck fishing has also lived up to our hopes with good catches of Cod along with a few Pollack to plastic eels and shads. The Mackerel are arriving along with some large Bass following. Bernie Power fishing from his own boat Mojo landing a fine specimen a shade under 12lb. As usual in the spring, netters catching Brill along with some large Turbot in areas where we often fish with Mackerel and Sandeel bait, perhaps a conserted effort is required targeting these fish locally to set up a new rod & line fishery. Perhaps with the return of Cod last winter the Varne bank will return quality Cod to pirks like the good old days when charter boats would drift up and down the bank throughout he summer, their crews jigging like mad sometimes huge homemade pirks, hard work but the rewards made it worth the effort. The windfarm now under construction, covering some 10 sq miles of previously good fishing grounds will I am sure improve fishing for the whole area when it becomes a haven for the fish. The Skate fishing has turned on with good catches all over the area. Derek Edmond's group had a good catch in the Thames estuary with 14 up to double figures, along with quality Whiting . Thursday saw us visit the wrecks where Terry Gage's group caught 25 Cod to around 12lb.On the way back we feathered up some Mackerel on the Falls bank. The fresh mackerel forced us to stop and try for Skate landing 5, the best weighing 13lb 8oz, again quality Whiting made up the numbers. Len Hoopers group were hoping to get on the wrecks today but the NE wind stopped us so we tried for Skate, landing 7 before the wind forced us inshore. The water warming up by the day bringing the summer species and bait. The crabs are peeling now, the top bait at the moment for the Smoothounds and Bass. The Thornback Skate so prevalent all winter are now moving up river. The Cod have all but left the inshore grounds and moved onto the offshore wrecks. The fishing is holding up well with plenty of Codling and Thornback Ray in the area. The Sprat shoals are thinning out and the Cod are feeding up on the small crab that have arrived here in abundance. This puts the fish back on the bottom where we can catch them more easily. Some large female Thornbacks showing that are heavy in roe, so best to return these fish, anyway its always a pleasure to watch these majestic fish swim off and a photo keeps the memories. Just back in from today’s trip, (4th March) with Grahame Lovedays group from Gravesend and the Codling kept coming all day with fish to 9lb, along with a few Skate and quality Whiting an excellent day. This followed Len Hoopers group trip on 28th Feb where the Thornbacks dominated the day. Lug & Squid cocktails fished uptide on a flowing trace seems to be the killer rig at the moment although lug only baits also good. The fish baits not so effective now the Sprats have thinned out. The water has warmed a couple of degrees now, so along with the winter species, expect the first of the summer fish to show. Always one or two large Bass caught by accident this month. The spring codling fishing should continue now till late April when they will drift offshore. This past winter has been the best for a number of years and just when you think its slowing down it picks up again so make the most of it and check out our website on www.fishingramsgate.com for latest reports. Another trip with Len Hoopers group from Maidstone in Kent. After a slow start we got into the Skate and Codling and ended up with a reasonable catch. The best bait combo was lugworm herring or squid cocktails. The codling were crammed with crab, a good sign that the Sprats are thinning out. A fine day out with that summers coming feel ! Fishing difficult as expected for the time of year. Sprats are thick on the ground giving a false reading on the sounder, at times a constant line from 25' to 35'. I suppose everything that swims will be feasting on this high protien diet so trying to tempt them with anything else is a bit futile. This is a problem for us but a bigger one for the Cod as when they rise up to feed they are sitting ducks for the drift nets and some days many stone of Cod are being landed here, mostly fish around 3lb. If the remainder survive the summer it should be a good winter to come when they will be in the 8/10lb range. Along with the Sprats there are small Whiting in the area so plenty of fodder available. Skate will be arriving to spawn and should provide some sport inshore but the females should be returned to protect the future stocks. Large Bass will be heading towards the Thames Estuary followed by the schools of smaller fish. The fishing should soon improve with the spring codling run when they return to bottom feeding so along with the Skate and Smoothounds some good fishing ahead. Cod can be caught when the tide is running hard and the fish drop back to the bottom to escape the strongest currents or perhaps fish on top of the high spots. Along with the Cod the Dogfish and Whiting have returned so fish to be caught. The cold weather has arrived here with daytime air temperatures barely getting above freezing and water temps dropped to mid 40s .This has upset the dogfish somewhat as they seem to have all but disappeared. The Sprats have arrived and the Codling are feeding on them, although they will still take a lug/squid cocktail bait. The Thornback Skate are arriving in numbers now and will become more interesting as the Cod become obsessed with feeding on the Sprats. Water temperature remain high, still in the mid 50s and along with the clear water it must feel more like September than early November to the fish, so plenty of Thornbacks along with Bass and the odd Smoothound. The Cod fishing remains good with fish still being caught on the distant wrecks when the weather allows the boats to reach them. Quality Whiting also around in better numbers amongst the small ones, this being the first year for many that these better fish have reached us along with the biggest Pout seen for a while. Perhaps the strong measures the fisheries are imposing on the commercial fleet is making a difference.Lets hope so as they are struggling with small quotas. Inshore Cod fishing remains generally good, some days being much better than others, perhaps a few frosts and coloured water, more usual at this time of year will improve the fishing. December through to mid January, before the Spratts arrive is probably the best time of the year for the inshore Cod fishing and that we have been getting Cod inshore since September bodes well. Try north of Ramsgate on the large tides and South on the neaps for best results. A few small boats being launched from Palm Bay Margate enjoying the Cod revival but nothing like the numbers of past years when 20lb Cod were common, along with the odd 30lb fish, some weekends saw upward of 30 boats being launched from the slipway. Cod heading in and Bass moving out, you can catch them both on the same spot if your lucky, along with skate and the odd Smoothound. The Whiting have been around for a while now some of them a good size ideal for filleting. The Dogfish are still around but getting fewer as the autumn and winter species take over. Everyone wants lugworm now so getting more difficult to buy, but worth the expense as they do make the difference fishing for the Cod. The Dogs love the Squid bait, tearing it up and stopping the Cod getting a look in ! Plenty of fish around at the moment you just have to be prepared to go through the small stuff in the hope that the better fish will turn up, just make sure you have plenty of bait. Herrings replacing the Mackerel now and fresh or frozen one of the best baits for the Thornbacks that are around now in good numbers and size, just chop the herring up like you would a cucumber and fish on a strong 4/0 hook on a short trace of 30lb hook length. Check out the Ramsgate charter boats this winter as we can often get out when the South Coast boats are stuck in the ports due to the SW winds.